The Gap of Crag is the region of the Land of Cragnons surrounding the Downtown of Crag, appearing in Super Paper Mario. It is the setting of Chapter 5-2. There are many Cragnon sculptures and inventions dotting the area, such as a Yoshi statue and Cragvisions. The level mainly consists of finding three elemental tablets. The Pixl Cudge is found here. In pursuit of the abducted Cragnons, Mario and Co. headed for the Gap of Crag. What did the Floro Sapiens want? And where was King Croacus with the Pure Heart? Despire their hustling pace, our heroes never caught sight of the Floro Sapiens. The heroes come upon this area while chasing a horde of Floro Sapiens and their Cragnon captives. The level begins with a stretch with some Pokeys, Putrid Piranhas, and Squogs. At the end of this stretch is a deep pool of water with a platform above it and Cheep Cheeps within it. At the bottom of the lake is an air pocket with a chest containing a Water Tablet. On the other side of the pool is a door, which leads to the level's hub area. Entering the door, the crew see the Floro Sapiens escaping underground through a pipe and covering it with a large, indestructible block. In the middle of the hub is a very tall mountain that can be scaled using several blocks. There are three pillars at the top of the mountain. To the right of the mountain is a Warp Pipe leading to the background, where an Ultra Shroom Shake can be found. There is also an underground area inside a volcano depicting three symbols: stone, water, fire, respectively. To the left of the hub is a Putrid Piranha and a Clubba. There are some Brick Blocks which appear as Hard Blocks in 3-D and conceal a ! Switch. The switch creates a hill that can be used to reach a door. Through the door is an area with a Stone Buzzy, some Pokeys, some Rawbuses and a Tech Cursya. In 3-D in the area around the Cursya are several ? Blocks. Most contain coins, but there are also: Pal Pills, a Zombie Shroom, a Ghoul Shroom, a Speed Flower, a Slow Flower and a Mushroom. Over near the beginning of the area is a rift that Fleep can use to find a switch that creates a hill to reach a Cragvision set depicting someone running around a statue, a hint as to the location of the Stone Tablet. In 3-D, a path can be found that leads to an underground area. There is a fire-shaped stone under an arch. When Bowser breathes fire on it, it breaks to reveal the Fire Tablet. On the right side of the hub are some Clubbas and a Cherbil. There are two Mushrooms in Hidden Blocks to the left of a door and on the door's right are two pipes, a Mighty Tonic, a Save Block and a Cragvision set depicting the location of the Fire Tablet. Through the door is pit that can be crossed with a moving platform and a Cragvision depicting someone swimming underwater, hinting at the Water Tablet. In this area, the heroes encounter O'Chunks, who demands a rematch after his defeat in Chapter 1. Dimentio then appears and warps everyone to Dimension D for the fight, then leaves again. O'Chunks attacks, but is defeated once again. Dimentio returns and tells O'Chunks of an experiment he wants him to try, claiming it will assist Count Bleck. The duo leave and the heroes continue their search. After O'Chunks' defeat, there will be several Stone Buzzies in this area. Cudge shouting out the word the player chooses. Beyond O'Chunks is a stone pillar, revealed to be a statue of a Yoshi in 3-D/ Running around the statue will cause the Stone Tablet to appear on the Yoshi's nose. The elemental tablets must be placed in the pillars at the top of the hub's mountain in the order found in the volcano. Doing so will cause the Pixl Cudge to appear. Cudge desperately seeks sentient interaction and begs the player to speak to him. He asks their favorite word. If the player fills up all eight available spaces with their word, Cudge loudly shouts it out and joins the party. His hammering ability allows the heroes to destroy the yellow block and go underground to the Floro Caverns. 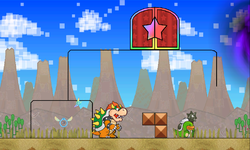 In the area with the Star Block, a Stone Buzzy card can be found in 3-D.
Mario and Luigi return to this area much later on in the game while chasing Dimentio through the seven worlds. The cave drawings in the volcano. "This ruin-packed valley is tucked between mountains. O'Chunks attacked us here, but we beat him again. We also met Cudge the Pixl at the top of a mountain." This page was last edited on December 11, 2018, at 18:09.